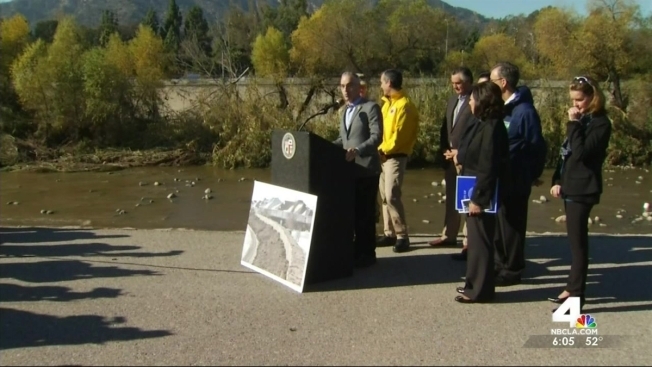 El Niño and vegetation growth compel precautions against Los Angeles River overflowing. Not since the Los Angeles River was lined with concrete decades ago has it ever overflowed its banks. But now, after the first week of El Niño-influenced storms in what is forecast to be an extremely wet winter, officials see need to, in effect, raise the top of miles of riverbank by installing prefab barriers. It will give the river another four feet to rise before overtopping the bank. "We're preparing for a worst-case scenario," said Col. Kirk Griggs, commander of the LA district of the Army Corps of Engineers. Three days earlier, as the year's first series of storms was drenching the southland, Griggs had declared a district emergency. Griggs joined Mayor Eric Garcetti and County Supervisor Hilda Solis, along with other officials, for a riverside briefing on precautions being taken. The concern is focused on three miles of riverbank on the stretch of river that parallels the 5 Freeway near the border of Los Angeles and Glendale. Vegetation in the river bottom has significantly reduced the river's capacity, Griggs said. Between Colorado Street and Fletcher Drive, the original design capacity of 78,000 cubic feet per second is now estimated to be only 40,000 cubic square feet —-barely half — according to the Corps. Adding the barrier is projected to increase the capacity up to 60,000 cubic square feet. Bringing it all the way back to full capacity will require removing vegetation. Upriver, near the Victory Boulevard crossing, vegetation has reduced capacity from 40,000 cubic square feet to 25,000, according to Corps figures. The plan there is to restore full capacity by removing native vegetation along with nonnative, Griggs said. Peak recorded river flows during the rains this past week remained well below capacity. However, there were breaks between the storms, allowing the river level to drop. El Niño winters have been known to produce rain nearly continuously for days on end. Even so, officials said it is unlikely runoff levels would reach capacity, but considered the $3.1 million barriers a worthwhile precaution. "If it floods there is risk for significant damage," said Mayor Garcetti. "I'm definitely on the side of abundance of caution," said Los Angeles City Councilman Mitch O'Farrell, whose 13th district includes a stretch of the river. Similar barriers, manufactured by Hesco, were used to shield Fargo, North Dakota from flooding in 2009. The barriers for Los Angeles are being shipped and expected to arrive Saturday, but installation could take several weeks, according to Griggs. He is hopeful they will be in place for February, historically the Southland's wettest month. Apart from the barriers, the Corps has allocated half a million dollars to an account for removal of vegetation, but will need additional funds for clearing other stretches of the river, Griggs said.